Republicans have issues, but Democrats have them too. Witness the two individuals who dominated this week’s news—and who conveniently represent the left’s most crippling problems. Hillary Clinton is again everywhere, touting her new memoir and adding to the list of who and what are to blame for her loss: Joe Biden, Bernie Sanders, Barack Obama, James Comey, Jill Stein, Vladimir Putin, Julian Assange, Anthony Weiner, sexism, misogyny, the New York Times , lazy women, liberal activists and the “godforsaken Electoral College.” All she’s missing is climate change. Hillary’s take on “What Happened” has unsurprisingly unleashed another round of analysis about her mistakes—Wisconsin, deplorables, email. These sorts of detailed postmortems of failed campaigns are popular, but they tend to obscure the bigger reasons for failure. In this case: The Democratic Party saddled itself with an ethically compromised and joyless candidate, because it had nobody else. Hillary spent eight years planning her first presidential bid, and the next eight warning Democrats not to get in the way of her second. The Clinton Foundation was erected to serve as bank and Rolodex, and to enable the Clintons to retain their grip over the party. And that party was committed to a Clinton coronation, right up to Mr. Sanders’s cheeky assault. Mr. Obama aided Mrs. Clinton’s ambitions by decimating his party. By the time Barack Obama finished his eight years in office, his party held 65 fewer House seats, 14 fewer governorships and controlled 30 fewer state legislatures. It had turned a once-filibuster-proof Senate majority into minority status. The big-tent Democratic coalition shriveled to a coastal, progressive minority, wiping out a generation of Democratic politicians and most of the party’s political diversity. And so the party nominated perhaps the only Democrat in the country who could rival Donald Trump in unpopularity—and beat him in untrustworthiness. 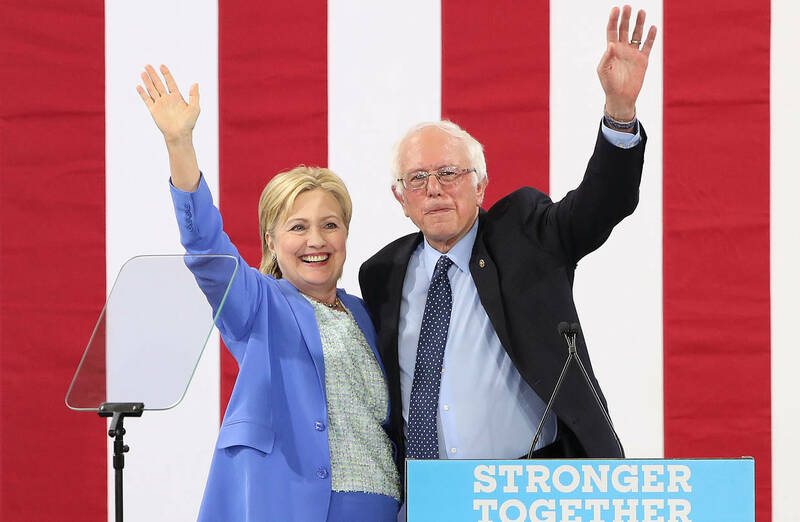 Mr. Sanders refused to go after Mrs. Clinton on her ethical baggage, even though it was her biggest weakness and despite how glaringly obvious was the risk that her foundation and server scandals would hobble a general-election campaign. The parties gave the country a choice between two unpopular people, and the country disliked her more. The real question is how Democrats rebuild a party whose senior leaders in the House boast an average age of 72 and which has almost no young, experienced up-and-comers. Which brings us to Mr. Sanders, the symbol of Democrats’ other big problem. This week the senator, flanked by about one-third of Senate Democrats, released his “Medicare for All” proposal to nationalize health care. These are the ascendant voices in the party. Yet there are few of them, because their agenda is highly unpopular. Mr. Sanders was an unexpected force in the primary, though mostly because he wasn’t Hillary. Sanders supporters resent this argument, and claim the only reason his agenda didn’t triumph is because the DNC robbed him of the election. If so, why did Bernie’s people and ideas fail spectacularly everywhere else on the ballot? In Wisconsin Mr. Sanders campaigned for Russ Feingold, who promised a $15 federal minimum wage, an end to trade deals and free college. Mr. Feingold lost to Republican Sen. Ron Johnson. In upstate New York, in a white, working-class district, Mr. Sanders endorsed Zephyr Teachout, who railed against bankers and lobbyists, fought fracking and Citizens United, and opposed trade. Republican John Faso beat her for the open seat by eight percentage points, on a promise to kill Dodd-Frank. Democrats wouldn’t even vote for Tim Canova, the man who primaried Mr. Sanders’s archenemy, Debbie Wasserman Schultz. An extraordinary 79% of Colorado voters said no to a ballot initiative for ColoradoCare, the state version of Mr. Sanders’s universal health-care proposal. This in a state that Hillary Clinton won. Liberal Vermont pulled its own single-payer plug in 2014. In California, Mr. Sanders endorsed and campaigned for Proposition 61, which was designed to impose prescription drug price controls. It went down to substantial defeat in a state Mrs. Clinton won by 30 points. Progressives will argue that all they need to elect a Bernie or an Elizabeth is the right way of pitching their “populist” policies of free health care or price-controlled drugs to the white working class and independents. But so far they’ve been unable to sell them even to bright blue states. And this wishful thinking ignores that even if voters supported some of those provisions, they’d also have to swallow a progressive agenda that includes an energy crackdown, a retreat from the terror fight, and the culture of identity politics. Republicans have failed to unite or govern or pass their biggest priorities. But the political analysts are setting themselves up for another surprise if they ignore the big reasons Democrats lost this election, and what comes next. Ten months after losing the 2016 presidential election, Hillary Clinton is out with a memoir, What Happened. Morning Edition host Rachel Martin talked to Clinton about her book, the election’s outcome and how she’s carried on. Here’s the full transcript of their conversation. The audio on this page is an edited version of the interview that was broadcast on Morning Edition. It’s actually great. It is wonderful being home having time to putter around clean closets spend, you know, long days going for walks, seeing my grandchildren, taking friends out to dinner. So it’s not where I wanted to be, but it is a great reminder of what more there is to do in life and what the future can be like. I’d like to start our conversation about your new memoir by asking you to recount a particular event. This is a campaign event that you did in Mingo County, West Virginia, a town called Williamson. This is coal country, and you had met many voters there weren’t happy with you. They were angry over comments that you had made around that time about wanting to “put a lot of coal miners and coal companies out of business.” So you knew this was going to be a tough appearance and you wrote in the book the following quote: “All I knew for certain was they were angry, they were loud and they hated my guts.” Can you just describe what that day felt like to you and what it signified as you moved forward in your campaign? Well, it was a particularly difficult, even painful day because I had made clear for years, starting back in my 2008 campaign, that I understood what was happening in the changing fortunes of coal, that were largely global market forces, but also a growing recognition of the challenges that climate change posed. And I had given a number of speeches. I had a very well-developed plan to invest money into the area, and then in the midst of explaining that I said a sentence which I would, you know, I regretfully say, was taken out of context, blown up, and really was a rallying cry for people and others who were running the campaign against me to come out and blow this up out of all proportion. Now my campaign said, really, there’s no point going to West Virginia because Democrats haven’t won it in years. It didn’t matter whether you said something or not, a Democratic candidate was not going to win it. But I felt a personal responsibility to the people in that state who had been good to me in the past, and to my husband, and I also wanted to make clear that I was much more than one gaffe, and I had a very strong commitment to helping them, so off I went to Mingo County, and when I got out of the car, when I got to the health center that I was going to be visiting, there was a large, very vocal demonstration against me, and the people were yelling all kinds of insults and attacks. And in the crowd was a man named Blankenship, who had just been convicted — in fact, was on his way to jail — for the negligent deaths of a number of the coal miners that his company employed. So it was a fraught, really incredibly difficult time. I went inside and met with a group of people who were trying to do what I think we should be doing in communities like the ones I was visiting across our country, particularly in rural and small town America. They were trying to make things better. So this health center, which had been strongly supported with federal dollars, was providing better health care with a particular emphasis on the opioid crisis. We sat and talked through what more could be done. And one of the people who was there at the invitation of the health center was a laid-off coal mine employee, and I talked with him and his wife. He was really emotional about what it meant to lose that job. He talked about how hard it was to tell his children. They were getting by on his wife’s income from her small business. Well, he was. He was angry at me because of the comments, but his anger, his disappointment, his fear was much broader than that. And that’s what I was trying to address, and to tell him, “Look, I’m sorry that what I said came across that way and that’s not what I at all meant. In fact, I have a record of trying to help areas like this and I have a plan to do just that. But I understand.” And we did talk about what it felt like for him, a very proud man, to be unemployed. And I never doubted the hurt and the anger that so many people were feeling around our country, not just in West Virginia, but I thought what my job was to do as a candidate for president was to tell people what I could do for them if they gave me the chance to serve and that’s what I tried to do even that day. So you kept going to policy solutions and you’re saying you should have given a more emotional response? Your campaign advisers told you time and again that a significant portion of the American electorate didn’t trust you. They polled on that particular question, and that word. Donald Trump used that — he branded you as “Crooked Hillary.” Bernie Sanders even picked up on that theme. Why didn’t you tackle the trust issue head on? Well, we thought we did. And I certainly tried to do that. It was somewhat disorienting, I will say, because I came out of the State Department with the highest approval ratings of anybody in national public life. I think 69 percent approval. When we started the campaign we had every reason to believe that we had a path forward that relied on how people felt about me and how they thought about my work over many years. But it’s absolutely true that between the consistent pounding on me, first by Bernie Sanders, but more consistently by his supporters, and the theme that Trump stuck with, it really was hard to break out from under that. But as I say in the book, Rachel, despite all of that, I was on the path to winning and I felt great about the three debates. I thought we were on the right to, you know, move toward the end of the campaign. And then unfortunately the Comey letter, aided to great measure by the Russian WikiLeaks, raised all those doubts again. And so even though I won the popular vote, enough people in a few states, with respect to the electoral college, were just raising all these questions. And I saw that, we saw that, we scrambled hard those last 11 days to provide rebuttal and answers and came really close. But, you know, it was difficult. You mentioned, and you spent time in the book talking about the forces you feel were working against you. You also say sexism was one of them, but you yourself, in the book, acknowledged that a good number of young women didn’t vote for you, which is presumably not a sexist choice. They just weren’t inspired by your message. I think it’s a lot more complicated than that. I did win the women’s vote. I didn’t win the vote of white women, but I got more white women votes than Barack Obama did. I think it’s much more difficult to unpack all of this, and with respect specifically to young women, I do think that for a lot of young women, gender is just not the motivating force that maybe it will be in the future. But then it wasn’t. The same way that being African-American was really motivating and exhilarating for black voters. But as I point out in the book — and I think that chapter I wrote on being a woman in politics really will be of interest to a lot of women and men. I talk about a conversation I had with Sheryl Sandberg, who has really helped to put into perspective a lot of research that supports common experiences. And she said, look, the research is absolutely definitive. The more professionally successful a man is, the more likable he is; the more professionally successful a woman is, the less likable she is. And that when women are serving on behalf of someone else, as I was when I was Secretary of State, for example, they are seen favorably. But when they step into the arena and say, wait a minute I think I could do the job, I would like to have that opportunity, their favorabilities goes down. And Sheryl ended this really sobering conversation by saying that women will have no empathy for you, because they will be under tremendous pressure — and I’m talking principally about white women — they will be under tremendous pressure from fathers and husbands and boyfriends and male employers not to vote for “the girl.” And we saw a lot of that during the primaries from Sanders supporters, really quite vile attacks online against women who spoke out for me, as I say, one of my biggest support groups, Pantsuit Nation, literally had to become a private site because there was so much sexism directed their way. Why would it have ever gotten to the point where something like the Comey letter could have shifted so many opinions? Why was it ever that tenuous? I mean, you say in the book, “American elections are about change, or they’re about the future, or some combination thereof.” And for many people you are about neither. Did your candidacy have an irreparable flaw from the beginning? I don’t think so. When you win the popular vote by three million votes, and when there were all of these outside forces coming at me right until the very end, I don’t think you can say that we didn’t have a strong campaign. I’m proud of the campaign we ran. We had an incredible organization. We had more people working on the ground in states like Wisconsin and Michigan. I would say two things about that. First, there were certainly people who voted for him who felt like, for whatever combination of reasons — and there’s some good research about this — that, you know, they just weren’t happy with where things were and they didn’t know what they were going to do, and they did not vote for me. That’s absolutely the case. But you have to also look at the suppression of voters. The principal objects of voter suppression were African-American voters and young voters. There was a very extensive analysis about what happened in North Carolina recently in The New York Times and there’s been a lot written and much information collected about what happened in Wisconsin: 200,000 predominantly black voters being disenfranchised in the greater Milwaukee area. This was the first election, the first presidential election, where the Voting Rights Act that had been severely damaged by the Supreme Court decision in 2013, was fully in effect, and the Republicans wasted no time in doing everything they could to make it hard to vote. But not in the numbers that I needed. And that goes back to your question. If you look at the AP work that was done in Milwaukee, it’s quite chilling. The 85 year old woman — she no longer has a photo I.D. She doesn’t drive. She comes to vote with her Medicare card, her utility bills, a lot of identification. She’s turned away. The Navy veteran who moved from Chicago to Wisconsin, goes to vote, but he still has his Illinois driver’s license even though he had registered in Wisconsin — turned away. And I think that’s an interesting comparison. The voter suppression in Wisconsin worked. Across the border into Illinois, where they had not done any of this suppression, where they in fact made it easier to vote with same-day voter registration, they were immune to the impact of suppression. And, of course, I won in Illinois, just like I won in neighboring Minnesota. But in Wisconsin, Michigan, Pennsylvania in particular, as well as North Carolina, there was a concerted effort to suppress the vote. Now, I want to throw this into the future because, you know, the reason I wrote this book was not only to tell people what I believe happened, to explain the best I could, but also to point out some things that we have to as a country take seriously in order to avoid what happened ever happening in the future. And voter suppression is one of those things. Sexism and misogyny — alive and well and working in our politics and our society. But then the Russian role that was played I think is something that everybody, I don’t care what political party you are, must take seriously, because they are not going to stop. They were successful, and they’re going to keep at everything they can to destabilize and undermine our democracy. Although you do spend more than 400 pages going back in time and thinking about what if’s. Oh, I do. But what ifs that I think are realistic to think about because, you know, what if I hadn’t made the dumb mistake about e-mails? And it was a dumb mistake, but it was an even dumber scandal. What if the Russians hadn’t been literally encouraged by Donald Trump to do even more to disrupt the election? What if the Supreme Court had not reversed the Voting Rights Act, which I was proud to vote for when I was in the Senate, and I still maintain the kind of protections to make sure that no American is disenfranchised? Well, he wasn’t. And, you know, he ran in ’08, and he didn’t run in this time. If he wants to run in the future, he can do that. But I think that, as I start off explaining what happened in the book, let’s not forget the historical weight here. It’s really difficult to succeed a president of your own party who has served two terms. That is a historical fact. So I think it would have been tough for Democrats. I think that the closeness of our election, the hyper partisan attitudes that people have would have made it hard. But I was very proud of the campaign I ran and I think I was on the way to winning. And that didn’t happen in the end. And I don’t want what happened to me to happen to anybody, Democrat or Republican, going forward. Are you saying Donald Trump in some ways was unbeatable? Because it is so difficult to undercut the momentum, people seeking change, want to change parties after eight years. People didn’t see you as the change candidate, they would have likely not seen any Democrat as the change candidate, and he had the upper hand. Well, he dispatched about 16 Republican opponents who had been governors and senators and successful business people — that showed that he was really plugged in to a certain part of the electorate. And he started his campaign with a vile attack on Mexicans, calling them rapists and criminals, and he never stopped, and he was rewarded. Time and time again he was rewarded, Rachel, by the press, which saw this reality TV show going on. It was just irresistible. You know, show the empty podium, let’s really build it up. He calls for violence at his rallies, pays very little price for it, he insults every kind of person, just about, that we can imagine, and particularly with vicious comments about women, political as well as press figures. So he got away with it, because he did have a kind of attraction to people. He called it “not being politically correct” but in fact it was rude, it was, you know, discriminatory, it was bigoted, it was prejudiced, and yet it fed into part of the electorate that just wanted to have a primal scream. They didn’t like what was going on. They wanted something different. They weren’t interested in what you could actually do, because clearly Trump hasn’t done very much that he said he would do. But they really responded to his racial and ethnic and sexist appeals. We did. We did. And I really thought I was providing a contrast that would attract enough voters to win. And let me make two points about that. By all accounts I won every debate. I mean, even the after-action reviews were very positive. I thought that would really matter. And it was clear he didn’t know what he was talking about, he had really nothing to say. He just kind of fumed and carried on. That would have been enough any other time. But it wasn’t this time because my path toward November was being disrupted with Russians, and, you know, the emails once again in the news. But when we got ready for the general election, I had three different very smart groups work independently, and I asked them, “So what should be the theme of our general election?” and they each, amazingly, came up with the same slogan: “Stronger together.” Because what they argued, and what I believed, was that America does better when we’re working together, when we’re helping each other, when we’re aiming toward a future of opportunity where we have broad-based economic growth that includes everybody and, where, yes, we stand up for human rights and civil rights. So I was thrilled that all three of those individual groups of thinkers came up with that. In this climate where we were running against people who would say or do anything, and “Lock her up” was the chant of the year, it was hard to break through on that. But I and my campaign worked tirelessly to convey the message, to convey what was behind that message. And look, I say in the book, I think I would have been a really good president. I think I would have been a president that would have been working for all Americans, not just for those who voted for me. And that’s what is missing right now, among many other things in this White House. I want to ask you about something you write at the very beginning of this book. You talk about needing to learn lessons from the 2008 campaign to apply to the campaign in 2016. And you write this: that unlike in 2008, you were, “determined to run like an underdog and avoid any whiff of entitlement.” So you were aware that that was kind of around you in 2008. But there is and was this whole wing of the Democratic Party, many of whom ended up supporting Bernie Sanders, who believe that that is exactly how you ran in 2016 — as a person who, yes, had paid their dues, had done the work and had prepared, and that somehow you believed it was your turn to be president. Well, I just totally reject that. As you probably would have expected me to say. I find this criticism from Sanders supporters to be so off base. He’s not even a Democrat. That’s not a slam on him. He says it himself. He didn’t support Democrats. He’s not supporting Democrats now. I know a lot of Democrats. I’ve been working on behalf of Democrats, to be elected, to be re-elected, for decades. And so yes, I was familiar to broad parts of the electorate, and I’m proud of that. And I did well across the country. I won by four million votes. That’s a landslide. I won, really, by March and April. But he just kept going, and he and his followers’ attacks on me kept getting more and more personal, despite him asking me not to attack him personally. And, you know, I really regret that. But now he’s got a chance to prove that he’s something other than a spoiler. And that is to help other Democrats. And I don’t know if he will or not, but I’m hoping he will. Well, I thought it was pretty revolutionary that I was the first woman to have a realistic chance of becoming president. So I don’t know how any woman who is not familiar to people, since we have so many hurdles to overcome, could have even been in that position that I found myself. So if I won, you know, I would have been seen as a genius, my campaign would have been as perfect. I understand all of that. But I’m not writing this book, I’m not talking to you about it because I’m somehow aggrieved. I don’t feel that at all. I very much am still proud as I can be that I had the chance to run, that I got to be the nominee, but I am really worried about the country. I am worried about its direction. I’m worried about what I see as a mean-spirited agenda coming out of this White House. And my concerns as a former Secretary of State about what’s going on around the world. So I have a platform. I won more votes than anybody in American history for president besides President Obama. And I’m going to keep talking and trying to raise the questions that I hope Americans will take seriously and that I hope the press will take seriously, because we’ve got a lot of choppy water ahead of us. Although you say you still want a role in shaping the Democratic Party of the future, you’re still going to talk about the issues you find to be important, but there are some Democrats out there saying they don’t want you to do that. That writing this book is opening old wounds, re-litigating a past and it doesn’t help move the party forward. Have you reconciled that, that people might not want you around as the party steps forward? Well, they don’t have to buy my book, and they can turn off the radio when they hear me talking. I’m not going anywhere. I have the experience, I have the insight, I have the scars that I think give me not only the right, but the responsibility to speak out. And 2018 is going to be incredibly momentous. We have a chance I won 24 congressional districts that have a Republican member of Congress sitting in them. And I think that gives us some idea that maybe, if we are really focused we have a chance to pick up seats, maybe take back the House. We’ve got to defend the Democratic senators. I have a lot of ideas about how best to do that. And a lot of people are already calling asking for my help and my support. I’ve started a new organization called Onward Together, which is, you know, funding and lifting up some of the grassroots groups that have started around the country. I’ll be supporting candidates. So there will always be the naysayers. I understand that and most of them as you might notice are anonymous, but that’s fine. But I’m responding to a very large outpouring of people who want to know what I have to say, who are excited that I’m not going to be, you know, slipping away into the background, but going to stay front and center, doing what I can to try to speak out on behalf of this country that I love, and just want to do everything I can to make sure it’s strong going forward. Hillary Clinton’s new memoir is out today. It is called What Happened. Secretary Clinton, thank you so much for your time. Hillary Clinton is the first and only woman to have given a big US presidential concession speech-and she is the first and only candidate to say “I’m sorry.” Trust a woman to do that. Research finds that women apologize more than men, likely because people are faster to judge women for their behavior. Get an insider’s view into what was happening in Hillary Clinton’s hotel room the night she lost the 2016 Presidential Election. Bill Press and Peter Ogburn of TYT Network discuss with “SHATTERED” co-authors Amie Parnes and Jon Allen.